So it’s been a few months since your last dive and want a quick scuba refresher? Aquaventure’s Scuba Review program is the perfect way to refresh your dive skills. Whether you want a few reminders or need to go over the basics, our Scuba Review program will knock the dust off your gear and get you ready to go on your next dive! Our Scuba Review program is personalized for you to cover any and all skills that need brushing up. The class will be held in Aquaventure’s pool with one of the Aquaventure professional staff members. It’s quick and easy, and a good way to prepare for your next diving vacation. Instructor Guided Scuba Reviews are scheduled on select dates, however, you may request a private Scuba Review at your schedule convenience. Haven’t been diving for some time and want an in depth scuba refresher? PADI’s ReActivate™ program is the perfect way to update your dive skills and knowledge from the PADI Open Water Diver Course before jumping back into the water. ReActivate is personalized for you: You conveniently review scuba concepts on your tablet, mobile device or computer, then go diving in our pool with one of the Aquaventure professional staff members. It’s easy, and a good way to prepare for your next PADI course or get ready for a diving vacation. 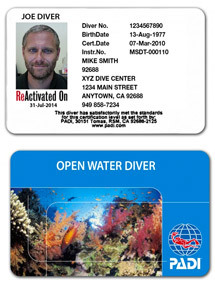 The best part is, divers who complete both the knowledge and in-water skill refresher receive a replacement certification card with a ReActivated date. Whether you’re feeling a bit rusty or just want to check out your equipment, join us for a ReActivate or a Scuba Review session to brush up on the fundamentals. $55 per person, including scuba equipment. $160 per person plus PADI ReActivate™ materials. ReActivate™ classes are taught on weekends together with our OW1 class & pool sessions or on a private basis. Call us 763-424-8717 to schedule yours today! Now that you’re back into the water, you can enroll in a specialty class to dive into something you’re interested in! Be a certified scuba diver at any level, with any certification agency.